There is no need to leave your home when planting amaryllis. Amaryllis isn’t a real garden flower, as it does best in the warmth of your living room. In winter it will bloom beautifully, an incredible flower bulb! The amaryllis is a flowering bulb that is extremely easy to force into bloom. The bulbs we sell are all grown in Dutch greenhouses. 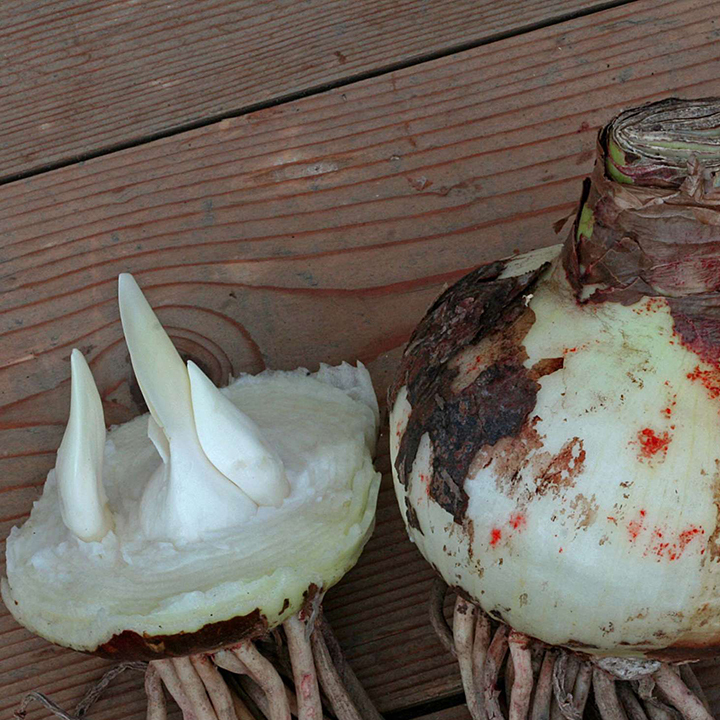 After they are harvested in August the bulbs are stored at the right temperature, allowing the flower buds within the bulb to develop in an optimal way (see picture). At the time we ship, our bulbs are ready to bloom. At home plant the bulb in a pot with the bottom half in the earth. Thus planted, the neck of the bulb will still show above ground (see picture). After that you can give them a warm spot indoors. Keep the soil moist to the touch, just as you would with most other plants. Depending on the variety, your bulb will bloom within six to eight weeks. An amaryllis bulb can also bloom on water, without soil (see picture). 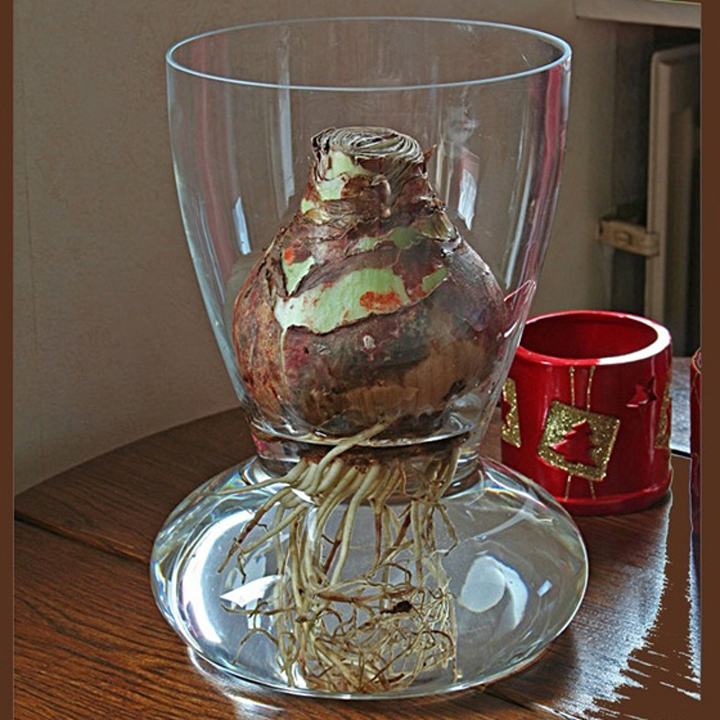 For this you will need a suitable glass vase, that will hold the bulb tight while allowing the roots to reach the water. A few days after you have placed the bulb in the vase, the water might discolor a little. No problem: just renew the water, rinse the roots clean and put the bulb back on the glass. After this the water will probably stay clean. The amaryllis is native to South America. They are tropical plants that feel their best in warm conditions. In a cool spot, in the hallway or in the bedroom, the bulbs will flower as well, but they will need more time to bloom and the quality of the flowers might be not as good. Important: To make an Amaryllis bulb bloom a second season is difficult. We promise you of course spectacular flowers the first season. Bloom in the subsequent years, however, cannot be guaranteed. Still, if you do want to make an effort to have your bulb bloom again, follow these general rules: After the bloom cut the flower stems and let the leaves develop further. Continue to water and feed with a standard houseplant fertilizer. By September stop watering. Late October the pots are best placed in a cool but frost-free place. Remove only the wilted leaves. After about six to eight weeks, the pots can again be given water and put in a warm spot. Repeat last year’s treatment. Repot bulbs only when necessary, disturbing the roots as little as possible. 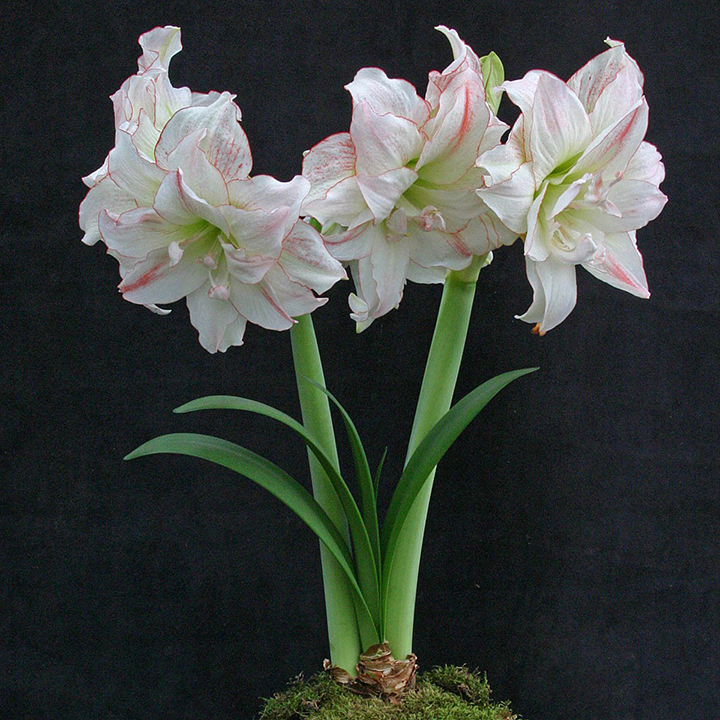 Read more on Amaryllis back in bloom.